This spring has already brought on concerns about poor weather resulting in delays on corn planting. At this point in time, there is still time. It is highly important to remain patient and wait for the right corn planting conditions. Planting into marginal conditions can result in problems all season long that could outweigh the benefit of planting too soon. It is recommended to plant corn into soil that will provide good seed to soil contact with soil temperatures at 50°F and rising. Corn does not germinate below 50°F and seed sitting idle is at greater risk of infection by disease pathogens and feeding from insects. An increased number of days from planting to emergence leads to poor emergence, poor crop growth, and a possible need for replanting. Other soil conditions are just as important as soil temperature. Planting into soil that is too wet can have repercussions on plant and root growth. Side-wall smearing results in roots that are concentrated in the seed furrow. This leads to poor root growth, an increased risk of nutrient and moisture deficits, and vulnerability to high winds. Figure 1. 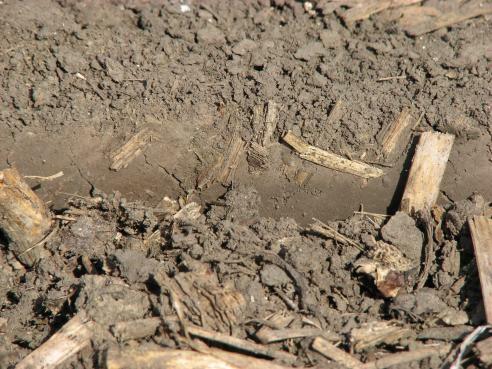 Sidewall compaction from planting into marginal conditions (photo: ISUEO). It is recommended to plant corn in Iowa from mid-April to early May to achieve the highest potential yield. The exact dates differ from year to year and depending on what part of the state you are from. This is due to different climate factors such as; precipitation, spring soil and air temperatures, and length of growing season. Recent research suggests waiting to plant can cause a larger yield decrease compared to planting early. For instance in central Iowa from 2014-2016, the highest yield potential was attained with early May planting dates. Planting in mid-April resulted in 95% yield potential and planting in early June resulted in 81% yield potential. While early planting will not always result in the highest yield potential, waiting to plant corn until late May or early June can cause significant decreases in yield. Figure 2. Corn planting window to achieve 98% yield potential (Corn and Soybean Field Guide, IPM 0001, 2016). While many farmers found 2017 corn planting to be a spring of playing catch-up compared to 2016,the 2017 planting progress ended ahead of the 5-Year average. It is still too early to tell how 2018 planting progress will proceed and early indications do not look promising. Looking at corn planting progress and prospective planting reports over from 2014 to 2017 the peak planting progress occurred with an average estimated pace of 1.2 million acres planted per suitable day (range of 0.94 to 1.34 million acre per suitable day). 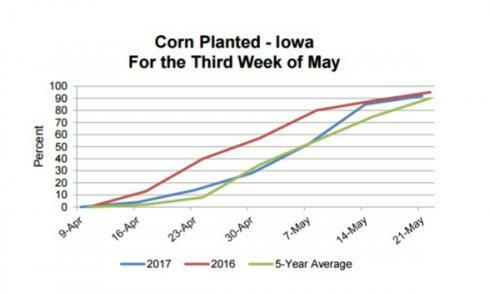 This peak planting rate typically occurred the last week of April to the first week of May. Figure 3. Corn planting progress for 2016, 2017, and the 5-year average (USDA NASS, 2017). 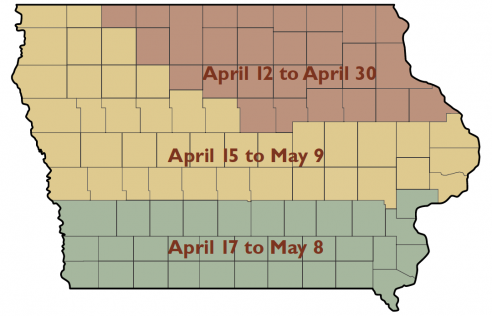 What if corn planting is delayed into mid to late May? Should you switch to an earlier maturing hybrid or keep what you had planned for? Preliminary research indicates that in northern Iowa longer season hybrids can have a greater yield potential whereas hybrid maturity is much less influential on yield potential in central and southern Iowa regardless of planting date assuming that hybrids adapted to the area are used. While there may be no benefit in yield potential to planting an earlier hybrid maturity, there can be risk management consideration. The main consideration must be fall frost risk. For this reason, it is recommended to plant well adapted hybrid maturities through May or early June planting dates. If planting gets delayed further consideration should be given to earlier hybrid maturities to ensure crop maturity before fall frost occurs. An additional consideration would be to switch crops to soybean if herbicides would not interfere with germination and emergence.